I started working on my daughters 2nd Birthday shortly after I had finished her first ;) Since she was born we have casually called her our little poodle so I knew that we had to do a poodle theme for her second birthday party. When I was looking up ideas for poodle partys the only thing I was getting back was the poodle in paris theme so I knew I had to put my creative cap on and get to work. My color scheme was established early, Ive always loved Navy and Pink together, I think its a classic combo that also gives a preppy clean feel in which I was trying to achieve. We designed the poodle graphic early using a frabic collection with the main pattern being quatrefoil and incorporating stripes. Im am a huge DIY'er and a planner. I have been gathering peices and ideas for months. Everything aspect of this party I had a hand in. I wanted this party to have a very modern preppy feel. My cupcakes were baked a local woman who also made her 1st birthday cupcakes and they were AMAZING!!! 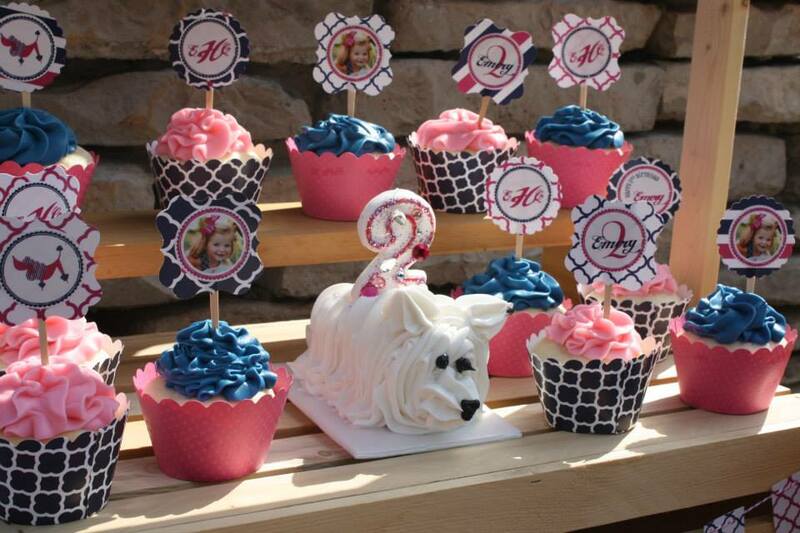 My favorite peice would have to be the poodle pastries stand. I went to my sister in law with the idea of a mini lemonade stand that I had envisioned to use in place of traditional cupcake stands. I couldnt be more happy with how it came out. I also love and so did the kids, Poodle ears (for the girls) and brown puppy ears (for the boys) that I ran across at a local dollar store in the dollar bin for halloween!! What a score! My sister is a hair stylist and I had her doing " poodle pedis" and the kids enjoying picking their polish and having their nails painted. I always say to be creative and dont be afraid to do things yourself. It only makes it more special and gives a special since of achievment. A very unique cupcake stand you have there! I so love everything about the party’s details, from the food, the presentation to the decor! Nice. I super like those wooden buckets. I LOVE ALL THE LITTLE UNIQUE ITEMS YOU CAME UP WITH. YOU ARE SO CRAFTY. IT WAS JUST BEAUTIFUL. I HAD TWO BOYS, SO DOING LITTLE GIRLS, THE PINKS AND FRILLY GOT LOST! GOOD LUCK, IT IS GREAT!